Unhealthy weight gain is becoming a fast-growing epidemic. This is a direct fall-out of the modern lifestyle that includes intense pressure to keep up professionally and personally as well as easy access to junk food. Along with this rising epidemic of unhealthy weight gain, there is also a great emphasis on looking young and fit, without the appearance of any flabby or loose skin. However, with all the advances in technology, people struggling with weight issues have no dearth of solutions, surgical and otherwise. These procedures not only help people deal with their thorny weight issues, but also help them get the body that they envision after massive weight loss. Usually, people who lose an excessive amount of weight tend to end up with saggy skin or stubborn pockets of fat that refuse to budge with traditional diet and exercise alone. While, even earlier people had access to procedures that helped get rid of the stubborn areas of fat and tuck away the loose skin, those procedures were majorly invasive in nature. But, as technology advances and gets more sophisticated, the cosmetic industry has been introduced to a number of non-invasive procedures that give patients the same results without the hassles associated with invasive procedures. The non-invasive and non-surgical procedures offer patients a host of benefits, provided they are done under proper medical care and guidance. Apart from that, the patient also needs to ensure they are taking proper care before, during, and after the procedure to ensure the most effective and long-lasting results. The ever-evolving field of cosmetic medicine constantly brings new and improved procedures into the market. And, the non-invasive fat reduction procedure being a comparatively new technique means there is a lot patients don’t know about. The first step in making the right decision is being aware of what non-invasive fat removal procedures entail. 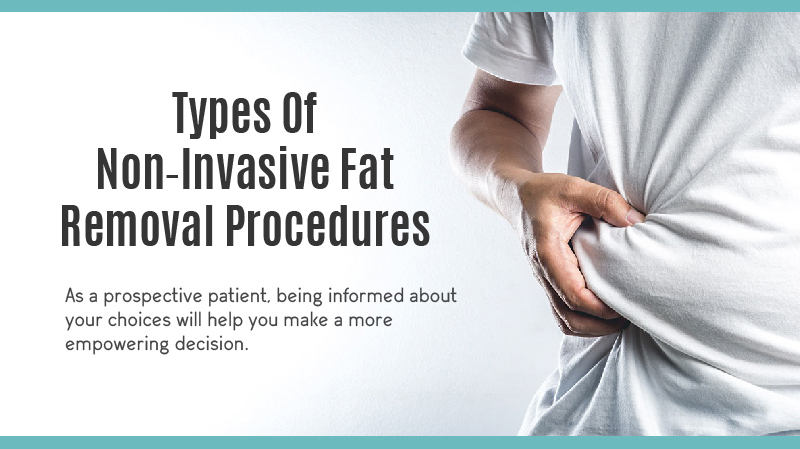 In this guidebook, you will find a detailed and step-by-step breakdown of the various factors you need to consider as a prospective patient for any non-invasive fat removal procedure. It is important to read through each step in the guidebook in order to get complete information about the procedure and make a wise choice. Who Should Consider Non-Surgical Fat Reduction? Non-surgical fat reduction is useful in the following cases. If you are struggling with pockets of fat that are resistant to diet and exercise. If you have sagging skin, post a massive weight loss. If you have undesirable fat deposits on your abdomen, flanks, back, or thighs. If you wish to achieve a slimmer look without going under the knife. 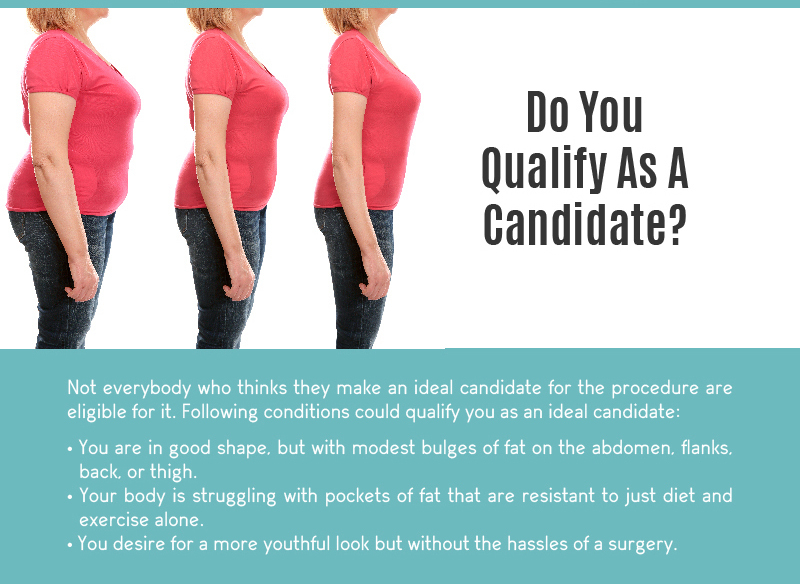 Not everybody who thinks they make an ideal candidate for this procedure are eligible for it. In order to ensure the procedure yields the best results, the candidate should meet the requirements that qualify them for the non-invasive procedure. 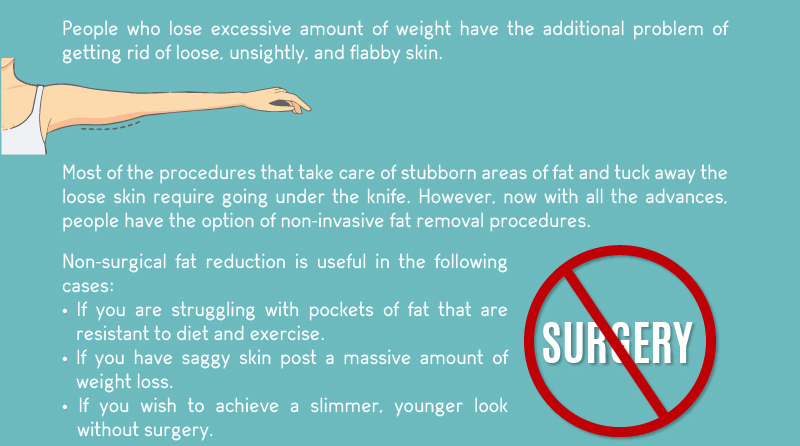 Following are some reasons that could qualify you for non-surgical fat reduction. The person is in relatively good shape, but with modest bulges of fat on the abdomen, flanks, back, or thighs that they wish to have removed. The person is struggling with pockets of fat that are resistant to the traditional diet and exercise regimen. The person aspires for a slimmer and youthful look, but without the hassles of a surgical procedure. Prospective patients should bear in mind that non-invasive fat reduction procedure is not a complete weight loss treatment. It is best suited to treat very limited volumes of fat that exists in the abdomen, flanks, back, and thighs. If the person has larger volumes of fat, this procedure may not deliver the ideal results. However, it is always advisable to check with a medical expert before getting a non-invasive procedure done, as they would be able to guide you in the best possible way that would help you get your desired body. Thanks to the many advances in medicine, people have more than one option to turn to when it comes to their health. Cosmetic medicine has also seen many technological advances, which has ensured that people can get the kind of body they envision without experiencing any inconvenience. In an age where people are constantly judged and put under undue pressure for their physical appearance, this is definitely a welcome breakthrough. The non-invasive fat reduction procedures provide people with the most sophisticated techniques to address their weight and other cosmetic concerns. Even though there are a variety of options when it comes to non-invasive fat removal procedure, but, sometimes many people are completely unaware of the options they have. Being informed about your choices will help you make a more informed decision regarding what is good for your body. Here is a low-down on some of the non-invasive fat removal procedures. This is similar to traditional liposuction, but involves the insertion of liquid into the area that is being treated. This is done to help prevent blood lose during the procedure and also makes the area more numb. The amount of liquid inserted depends on the amount of fat that is being removed. This procedure uses ultrasonic waves to break down the fat cells, and turn the fat into liquid. This makes it easier for the fat to be suctioned out through the cannula. In this type of fat removal procedure the potential risk of burns is minimized due to the heat that is produced by the waves. This non-invasive dermatological aesthetic treatment is used for the reduction of circumference of hips, waist, and thighs. Lasers are released through the treatment pads, triggering a chemical signal in the fat cells that breaks down stored triglycerides into free fatty acids and glycerol. The fat content is, then, transported around the body to tissues where it will be burned off during a period of post-treatment exercise. This is a therapy where cold laser energy is inserted into body tissues that are, then, absorbed by fat cells, which is broken down and absorbed into the body. This is a non-invasive, non-thermal approach to disorders requiring reduction of pain and inflammation, as well as stimulation of healing and tissue regeneration. Within the last few years, this procedure has been investigated as an adjuvant to liposuction for non-invasive body contouring, reduction of cellulite, and improvement of blood lipid profile. This revolutionary method provides fat loss solution which is easy, painless, and carefree. This system is applied to the targeted area, which is usually the waist, hips, and thighs, for a period of 15 minutes. Using this cutting-edge technology ensures patients feel nothing during the procedure, except, for feeling a bit different and lighter as they exit from the treatment due to the bio-stimulation that begins in their body to remove excess fat. It is essential that patients consult their medical practitioner in order to learn more about the procedure that is best suited to their weight loss and cosmetic needs. Certified, trained, and equipped to conduct the procedure. Considerable experience in conducting non-invasive fat reduction procedure. Your comfort level in discussing openly about your cosmetic goals. After you find a board-certified plastic surgeon, you need to set up a consultation, as you need to have an in-depth discussion regarding your body goals, the options available to you, and what you desire to see as the end result. The type of procedure or a combination of it. Risks and complications associated with each procedure. Apart from the above mentioned points, another essential factor that the patient should discuss with their doctor is about the preparation process. The preparation part is one of the most essential factors, as that, to a large extent, determines the successful outcome of any procedure. You need to be prepared not just physically, but also mentally and emotionally, going into the procedure. The preparation process entails the time before, during, and after the procedure. Preparation during each of the stages is equally critical in helping the patient achieve the best possible results. Here is a step-by-step guide on how to prepare yourself during each stage of the treatment in order to ensure you get the body you have always envisioned. Given below are some of the pre-treatment precautions you need to take. If you are a smoker or use any tobacco-related products, you need to quit to promote better healing. Any anti-inflammatory drugs, aspirin, or herbal medicine should be avoided as they could cause excessive bleeding. Get the lab tests and other important medical evaluations done as suggested by the doctor. Take any specific medications or adjust any current medications as prescribed by the doctor. Since the procedure is a non-invasive and non-surgical one, it is usually performed on an outpatient basis. Moreover, it is also performed in relatively much lesser time than required by surgical procedures. Many patients who are getting it done for the first time might be jittery about the whole procedure, as they are not sure what to expect going into the procedure. However, sometimes knowing how the procedure goes, and what to expect during it helps some patients calm their nerves. 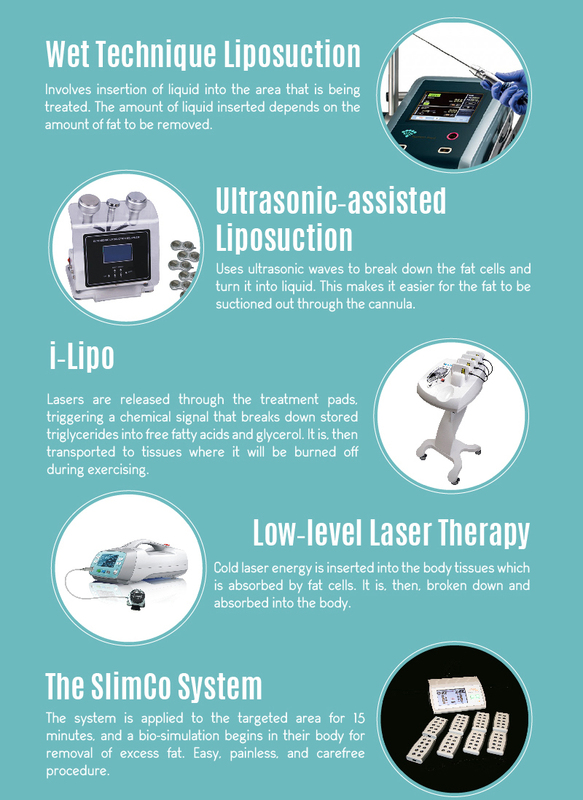 So, here is what you should expect during the non-invasive treatment. Medication may be administered to help you feel comfortable during the process. If you are undergoing laser-like liposuction, like the Slim Co™ system, a concentrated laser beam light will be flashed on the required areas, which breaks down the tissue and emulsifies the fat. Additionally, whatever treatment plan was discussed prior to the procedure will be followed by your medical practitioner. Since, this is a non-invasive technique, you can expect lesser bleeding, bruising, and inflammation. After the procedure is completed, you will be able to return home, and resume your normal activities. One of the benefits of non-invasive procedures, like the Slim Co™ system, is the minimal recovery time and downtime, apart from the less bleeding and bruising. However, it is still essential for patients to take proper care of themselves to ensure long-lasting results. Given below are some of the post-procedure care and precaution to be taken by the patient. Make sure you stay hydrated always. Drink plenty of water to make sure your body is properly hydrated. The doctor might ask the patient to stay off certain medications in order to enhance the recovery process. When you have a procedure that does not zap fat, rather, it has been liquefied and gone into the lymphatic system, you need to ensure it goes fast by raising your metabolism. Hence, you need to incorporate an exercise routine as recommended by your doctor. While, there is not much downtime to be expected, it is important to follow all the precautions advised by your concerned medical expert. Since the Slim Co™ system and other procedures are non-invasive in nature, there are no incisions or visible scars in the body. However, the patient may notice temporary redness in the area that was treated, along with swelling and numbness. However, these side effects are known to resolve quickly. If the patient has had a larger area of treatment, then, they may be prescribed oral medication. Recovery time is very minimal in the non-invasive procedures. Patients can resume work or get back to their routine activities without much downtime. Patients can start to see noticeable results within a month or two following the procedure. Since the adult body does not produce new fat cells, the results are usually permanent. As the fat cells are permanently destroyed, patients do not tend to gain weight in the treated areas. Patients should never hesitate or delay in contacting their medical practitioner if they experience any unexpected symptoms or have any doubts. In an age where millions of people are fighting the battle of the bulge, and where there is undue pressure of conforming to a certain body image, these procedures have turned out to be a life-saver for many. While, there were other methods that existed before as well, they required the patient to undergo surgical procedures, which usually left them with ugly scars, deep incisions, loss of blood, and long recovery period. 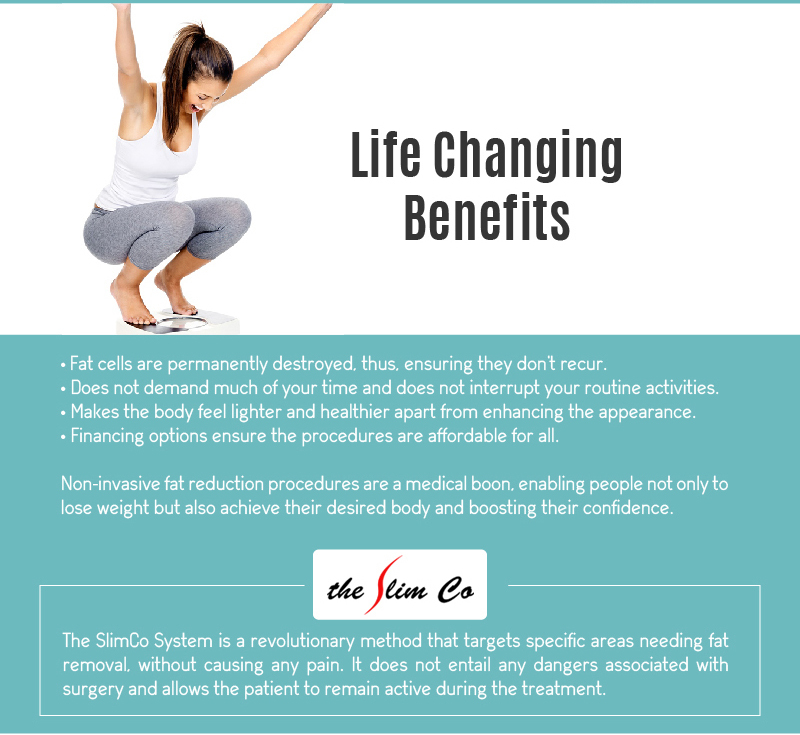 However, with the introduction of the Slim Co™ system and other non-invasive fat reduction procedures, all the hassles associated with the surgical procedures have been eliminated. Patients end up with the body they always envisioned with only minimal discomfort. If you are mulling over whether you should consider this procedure or not, here are a few advantages to help you move in the right direction. The sessions are rather quick, and lasts for approximately an hour. It takes less time as compared to the surgical procedures and even workouts, which might take months of intense exercises to see noticeable results. It is also a safe procedure and provides authentic and effective results. This procedure does not demand much of your time. It is usually done as an outpatient procedure which can be done in approximately an hour’s time. And, even the patients’ routine activities are left uninterrupted as the recovery time is very minimal. The patient can expect to resume their normal activities once they are done with the procedure. This procedure can be combined with other body improvement techniques, as recommended by your doctor. Other body improvement techniques like body contouring can be combined with this procedure in order to maximize the advantages. Losing weight in itself improves the person’s health drastically. And, having the stubborn bulges treated with the non-invasive procedures makes the body feel even lighter and healthier, apart from improving the appearance. It minimizes the person’s risk of getting certain diseases that can occur as a result of having a lot of fat in the body. If you fear the procedure may not suit your budget, there is financing options available. Many doctors work with financial institutions to ensure the treatments are affordable for all the qualified patients. This can, then, be paid off in convenient installments by the patient. There is a major improvement in the person’s physical appearance, which, automatically boosts their confidence. Looking and feeling good are very important aspects which can increase a person’s motivation levels. As the fat cells are permanently destroyed, the results last for a long term. The fat cells are eliminated from the body, thus, ensuring that they don’t recur. With healthy lifestyle choices, including diet and exercise, patients can ensure they maintain the results. Non-invasive fat reduction procedures are a medical boon for people who not only struggle with stubborn pockets of fat, but want to enhance their appearance and boost their self-esteem. If you have been struggling with your weight, and have failed to get any results from your diet and exercise routine, then, getting non-invasive fat reduction procedure done will definitely turn your life around for good, not to forget all the admiring second-looks that you will attract!